The following excerpts were taken from The Book of Awakening by Mark Nepo. Enjoy! How easily we get caught up in defining who we are in relation to those around us. We first find ourselves alone in joy of what we’re doing. But somehow, there are suddenly others along the way, and we lapse into the breathless race of comparison, and then we are hopelessly running to avoid being termed a failure. Buddha, not thinking of himself as anything but present answered, “No…not a God,” and kept walking. But the dazzled monk pursued him, “Then you must be a Deva, ” and Buddha stopped and said, “no…not a Deva.” and kept walking. Can it be that our purpose, no matter who we run into, no matter what we are told, is simply to be awake? Place a blanket for the chest to lie on as well as fill in the belly area and one blanket for a pillow. 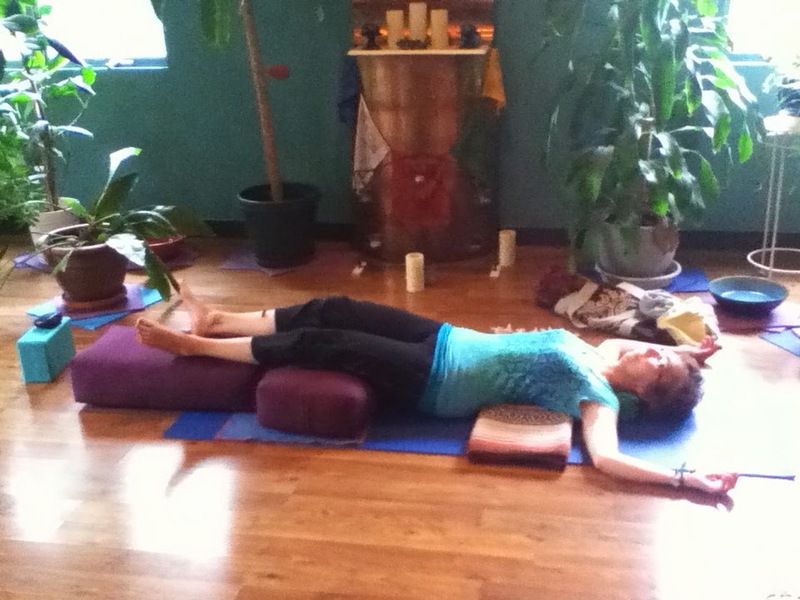 Lie belly down with legs extended, arms bent slightly out to the side. Can hold onto your neck roll to ground through the palms. Turn your head to one side and change direction when you need to. Additional support at the ankles. Add a blanket over top for comfort and warmth. Sit on a blanket with sitz bones at edge. 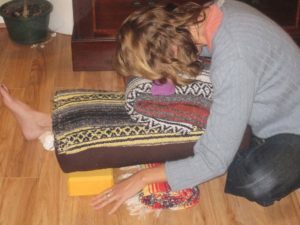 Place soles of the feet together, creating a diamond shape between the legs. 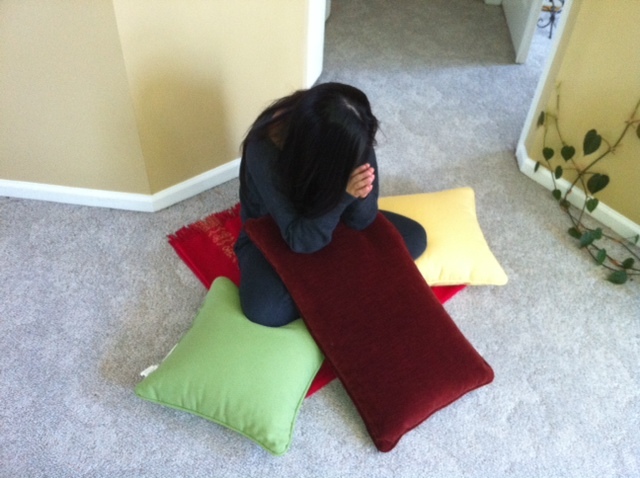 Add pillows, bolster or blankets under knees to keep them held up. Place a bolster or pillow ton your lap. 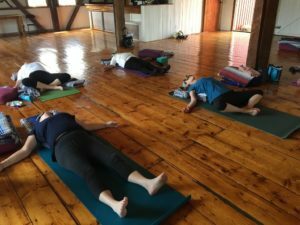 Inhale to lengthen the spine, exhale and as you extend slightly forward with lower spine, release head to the support on your lap. Place one bolster horizontally on mat (for the knees) and one vertically (for the feet, ankes and lower legs). 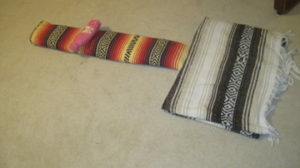 Arrange a triple-folded blanket horizontally (lumbar and thoracic spine area). 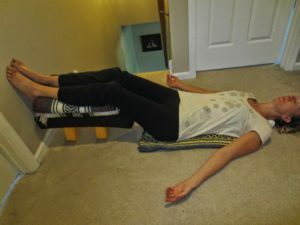 Recline legs over the bolsters and lower the upper body on the blanket. Adjust so that the tips of the shoulder blades are right above the blanket. 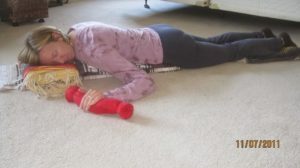 Add neck pillow under neck and move arms to Goddess position if comfortable for your shoulders. Otherwise, they can go by your side or stack hands on top of your belly. Cover pelvic area with a blanket.